Accessory: Chopstick type cases with poison senbon needles. Body: Her belly button is pierced. Her lower lip is pierced three times. Her ears are pierced several times. Her nose is pierced, her eyebrow, and her tongue. Shirt: Long sleeve fishnetted shirt over a black tanktop. Pants: Black capri styled pants. Accessory: Belt that holds weapons and two weapons cases strapped to her left thigh. She uses Kunai, Shuriken, and Senbon needles. She also uses her Kekki Genkai; Shindouhaji (Vibration: Hold). It's much like Gaara's Kekkei Genkai, but she controls the vibrations around of her. As she moves, her control of the vibrations move. The diameter around of her is a good thirty yards. Leanna's chakra can be fused with the vibrations around of her. And vibrations are caused by ANYTHING. Even someone breathing. How amazing, right? Her 'sight' is enhanced, as well as her sense of touch and feel. She could feel someone approaching her before she saw them. She can also have the vibrations tighten around of someone and cut off air supply, but that's only if they're in range. It has it's restrictions. She can also follow what people say and do. She can also follow people as they move. Because of her Kekkei Genkai and it's range, she can feel or 'see' ahead of her. Say she's running and needs to get around of a tree, but she'd rather not slow down and move around of it.. She just simply runs until she's near the tree and then -bang- she's on the other side.. But, it looks as if she's running through the tree. It's all a simple illusion. Instead of phasing through the tree, or smacking face first into it, she can feel the other side of the tree with the Shindouhaji. She then uses a simple jutsu to have her disappear and reappear on the other side of the tree. Mood/Temper: She's a very honorable person. She can be quiet, but she's usually loud and very approaching/approachable. Likes/Dislikes: She loves making new friends.. She hates mean/rude people. She's always ready for a fight. 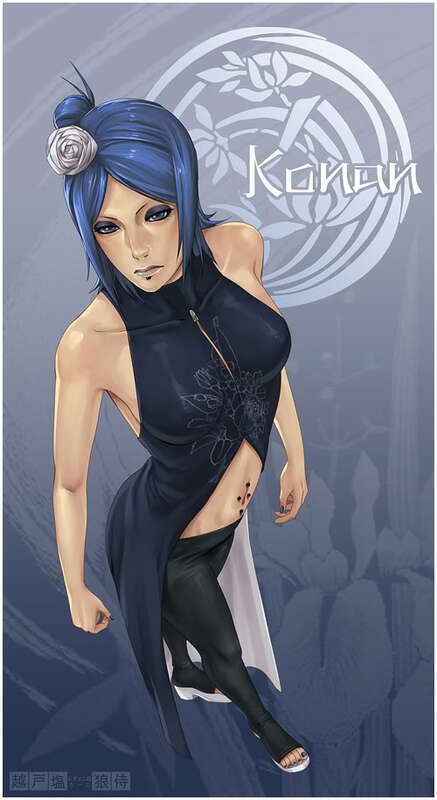 Leanna is not exactly certain that Pein and Konan are her parents... But she is almost positive they are. She was abandoned at birth, and raised in Iwagakure along with Deidara. They grew up together, him being about six years older, practicing with their newly acquired 'powers' or Kekkei Genkai's. She grew up as a hard working individual... until one day, her best friend was taken away from her. She was lost. She ran away and caught up with the Akatsuki since then... But, they had a new name.. the Higure. 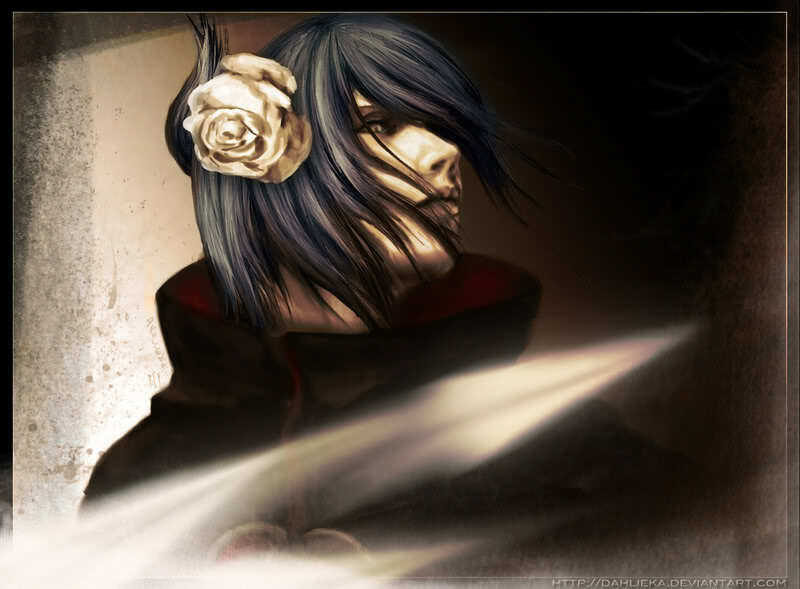 There was no more Pein, Konan... They were all.. dead. Her parents had been taken away from her, as well as her best friend. But, she was a dangerous kunoichi and would never give up killing for a living. Deadly is what she was, and determination drove her forward. I did. Go read underneath of "weapons." You seem very confident. Funny. You don't even know, do you? And, Atreyu will more than likely approve me. I doubt Pein and Konan are her parents since this whole story line is supposed to be far enough in the future that all main characters are dead. Not saying it's a big deal, just remarking. It's asmall detail that I would like fixed but all in all will not effect her approval. And the fact that the REAL series isnt done yet, and therefore Pein/Konan could die before doing the deed (Unprotected, at that) with Konan/Pein. No to mention the fact that any child of Pein would probably be regarded as a threat or enemy (Even if they werent Higure) to most villages, the Leaf and Rain (From what I've read on wikipedia about the stuff Pein did there) in particular. Now don't start that again. I said it's a small discontinuity that isn't vital to her approval, just something I'd like to see fixed. But it's not a big deal, like I said. I see what Michael is saying, but like he said it won't interfere with her approval. However, if she is the son of Pein and this is just a reminder she cannot have the Rinnengan. Lolz! Of course she isn't going to have the Rinne'gan. Lolz~. Impossible. Nopenope. I do need to make her a bit older, if she's actually going to be their offspring. But, I can do that. :] No problem. Haha. ... Explained her Kekkei Genkai a bit more... There's even more to that but it's best if you just allow me to show you in RP and not fights... I've basically shown what her Kekkei Genkai is like in the fight with Kokoro; how she copied him and trapped him etc. Ok read the full thing. 1. You are not raised with Deidara, it has been stated that everyone from the original series is and has been dead for years. 2. Higure is not or has it ever been Akatsuki neither has it been associated with it because once again, everyone is and has been dead for years. Update and fix your history. 3. Rick mentioned having a problem with her Kekkei Genkai. It being too powerful I believe but I don't know.